Oh! What memories. What a team! Gil Merrick in goal. England’s number one. We used to call him No Gloves, He hardly ever wore gloves. You will find very few pictures of him with gloves on, and if you do they were just woollen ones. Ted Duckhouse played at right back, and later at centre half, He broke his leg in the semi final replay of the FA Cup, against Derby County. No substitutes in those days. We lost 4-0. Cyril Trigg also played at right back. ( He also played centre forward) Dennis Jennings at left back. His sliding tackles were legendary. Don Dearson, at right half. He could throw the old heavy leather ball right into the goal area. Then Arthur Turner Centre Half. Absolutely no nonsense type, and fearless. Later became Blues Manager. At Left half there was Frank Mitchell. A very cultured left footer, from Australia. There was also Fred Harris, who seemed to fit in anywhere at half back. A very cultured player. When he retired he was a Physio in Acocks Green. On the right wing, there was Ambrose (Jock) Mulraney. A comedian at times. I saw him once dribble his way down the wing. Stop at the corner flag, put his foot on the ball and raise his right hand in the Police stop position. The opposition stopped and he then proceeded to dribble past them again, and scored. I think it was Watford, but cant be sure. At inside right, we had Neil Dougall, a guy with an unstoppable shot, and a tireless worker. At Centre forward there was Charlie Wilson-Jones. A Centre forward from pre war Blues. I think he took over from Blues leading scorer, and I believe still is Joe Bradford. At inside left, one of my favourite players, Harold Bodle. A player respected by everybody. At outside left, a Welsh International winger who could beat most, and a terrific left footed shot..George Edwards. You will have noticed, there arent defenders or midfield or strikers, in the team. There werent those type of teams around then. The game was played with, two full backs, three half backs, and five forwards. 2.3.5 formation if you like. Full backs and centre half did the defending. The two other half backs did throw ins, defending and attacking. The two wingers supplied the crosses and the three other forwards the goals, although anyone could of course score if they could. This can be seen when you see the leading goal scorers were all the five forwards. Wilson-Jones 20. Dougall 10, Bodle16. Edwards 13, and Mulraney 13. It wasnt until Alf Ramsey became England Manager in the 1960s that what was called at the time, the formation , Wingless Wonders. Came about. Now of course there are all sorts of numerical formations. I wonder what 1 – 10 would look like? Back to 1945/6. We won that league on Goal difference, from the Villa. I cant remember what the difference was, but it was fractional. I think we beat Watford, down there three nil, and that was enough. One game I remember was against Charlton at St Andrews which we won 1-0. They had a penalty and their Goalkeeper, Sam Bartram came up to take it. He hit the ball so hard against the crossbar it bounced way past the penalty box. Charlton ended up third. Yes that year we won the first league after the war and I remember everyone was very miffed, when the leagues started up again the next season, we had to go into the old 2nd Division. We did beat a few teams though, Albion 4-0. Swansea 5-0. Spurs 8-0. Chelsea 5-2. Millwall 4-0. Leicester 6-2. Southampton 4-0, and Villa 3-1 and 2-2 at Aston. To name a few. In the F A Cup, we reached the Semi-Final. In those days the rounds were played over two legs, until the semi-finals, which were knockouts. 3rd round, Portsmouth H 1-0. A 0-0. 4th round, Watford H 5-0. A 1-1. 5th round, Sunderland A 0-1. H 3-1. 6th round, Bradford A 2-2. H 6-0. Semi final at Hillsborough, (Sheffield) Derby County, 1-1. Replay at Maine Road,(Man City) 0-4. This is where Ted Duckhouse broke his leg. Ive typed this blog from my notes and memory box of yesteryear and I stand corrected if anyone wishes to do so. I will not take offence. The photo is not of the League South winning team (beat the Vile on goal difference) but of the next season’s Second Division Champions. You will notice that Mulraney has gone and Jackie Stewart is on the right wing (he once scored 4 against some team) and Trigg has replaced Wilson Jones at centre-forward.When Bartram took that penalty, Charlton were top of the League. At Villa Park, with us 2-1 down, Harry Parkes came up to take a penalty for The Vile, which Gilbert saved. In the last 5 minutes, Neal Dougall ran from almost the half-way line to equalise. Blues had had an injury problem at centre-forward, so Don Dearson (a wing-half) played there and scored a goal like Maradonna’s against Shilton. what memories come flooding back. The picture i have in my ‘den’ is of the 1946 team: Dearson, Bodle, Harris, Merrick, Mitchell, Owen, Duckhouse, Dougall, Mulraney, Edwards, Turner (cap), Jones, Jennings as the League South Champions. I recall the Bartram Penalty and for some time saved the cartoon which appeared in the Sports Argus on the same evening. It showed the ball hitting the bar and the legend, ‘Bartram, Barslam’. Many of the squad including Merrick, Dearson and Bodle lived close by in the Brays Road area and I saw my heroes often but would not dare to speak to them. Interesting to compare those modest club houses with the mansions now habitated. Glad you old guys are reading this. I thought I was the only one around. Happy days Hey? What I wouldn’t give for the old days of a full house and the old Kop. Tried very hard to get a photo of the team I’ve mentioned, but couldn’t get one anywhere. If anyone has one post it up please. I’m sure it would be appreciated. Just leave it to Mulraney, just leave it to Mulraney. 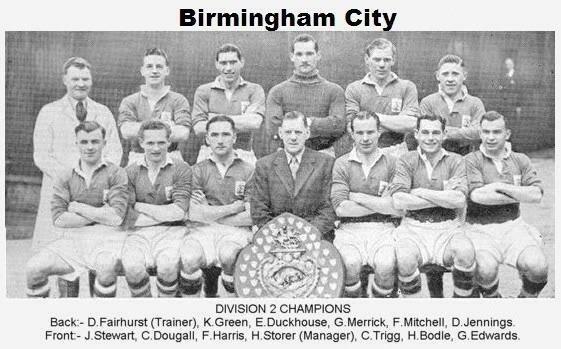 Great MEMORIES.I watched all of Blues home games and could not believe how Gil Merrick was not in the English team (Frank Swift was) but my favourite was Harold Bodle,what a hard worker.Pity the Blues of today cannot match that side.